In the year of 1992 local Rome business man, Sergio Cragnotti bought Roman club S.S Lazio from Ginamarco Calleri. It was the start of the most successful period in the club’s history with record breaking amounts of money going into the club. Cragnotti always had a passion for Lazio as the whole family did as well but it was not until his brother Giovanni encouraged him to try his hand in the world of football ownership. On March the 3rd 1991 Sergio Cragnotti was seen in the stands when Lazio played Juventus. Rumors then started circulating about Cragnotti possibly getting involved in the Sky Blue side of Rome. His ambition for Lazio was to make them into one of the superpowers of the European game with him financially pumping millions into the club to attract the big names around Europe with Paul Gascoigne from Tottenham Hotspur one of the first names to arrive from abroad to play for The Eagles. The purchase of Gascoigne for 5.5 million pounds did not turn out to be the move that he expected with the Englishman gaining negative media attention as soon as he arrived in Italy due to confrontations with reporters on more than occasion and also belching down a live microphone. His antics were taken to by the supporters very well but not Cragnotti. As for the performances on the pitch, Gascoigne’s first season was one with many inconsistencies due to a long term knee injury he had from the year. A late equalizer against arch rivals Roma made the supporters take to Gazza even more but then next two seasons were quite uneventful with him falling out with managers, of shape and also a horrific leg break while trying to tackle Alessandro Nesta. He left in 1995 with his time with The Eagles being mixed. After finishing 5th in Cragnotti’s first season of ownership with Lazio qualifying for the UEFA Cup, he strengthened the team even more, bringing in Italian international Roberto Di Matteo from Swiss club Aarau on a free transfer and also Alen Boskic who came fourth in the European Player of the Year awards from Marseille for 4.5 million. The club managed to finish one place better the season after finishing 4th joint level with Sampdoria. The fans were starting to see slight progress under Cragnotti giving them hope for the future seasons. As for the signings made by him, Di Matteo proved to be a success as he became a regular under Dino Zoff. As for Alan Boskic he only managed to score only five goals that season, only one less then Di Matteo, but was a key provider for top scorer Guiseppe Signori. 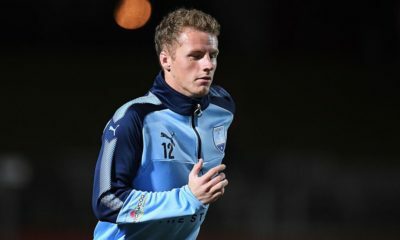 With no particularly big money moves for the next season, fans got the feeling that Lazio could challenge for the league with the squad that they had under manager Zdenek Zeman. The Eagles managed to finish runners up to winners Juventus. This was the best position the club had finished so far under Cragnotti. 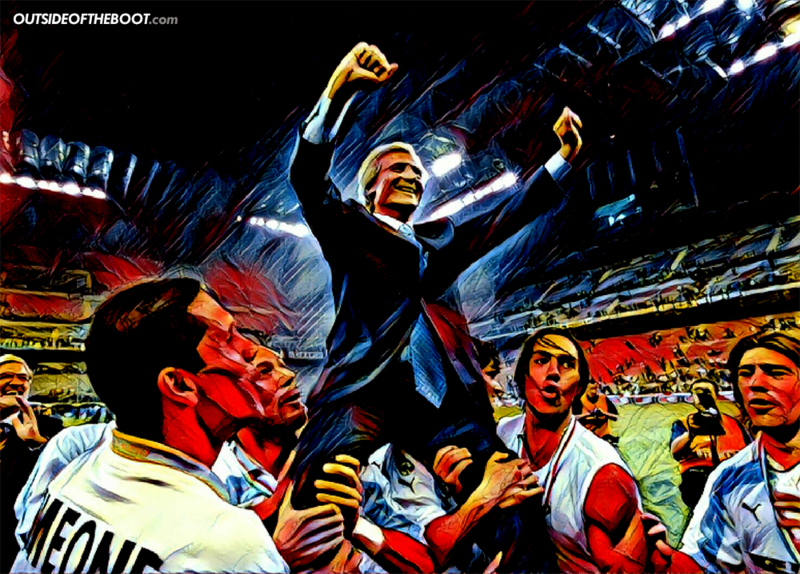 Controversy struck during the season between Zeman and Di Matteo when in an important game against Internazionale at the San Siro a defensive error lead to a late goal for Internazionale. The falling out between the two ended Di Matteo’s time at the club with his taxi being pelted with stones as he was going to the airport to sign for English club Chelsea. By this point, Cragnotti had invested millions into the club without any real success. Fans were starting to get frustrated by this as they felt with the millions being pumped into the club they were not getting any real success for the money Cragnotti was spending. Fortunes were about to change for Cragnotti as in the summer of 1997 he brought in experienced Swede, Sven-Göran Eriksson. This was to be the catalyst for Lazio in terms of their successful period that they were going to have over the next couple of seasons under Eriksson. His first signing was to bring Roberto Mancini with him to Lazio from his previous club Sampdoria. Eriksson’s first season in charge was a mixed bag finishing 7th in the league far lower then what Cragnotti probably expected of the team with a 3-1 defeat against Juventus being the final nail in the coffin in terms of winning their first Scudetto since 1974. As for the cup competitions they reached both the UEFA Cup and Coppa Italia finals with them winning the Coppa Italia in dramatic fashion against AC Milan after losing the 1st leg one nil at the San Siro. Milan looked like they wrapped up the tie a few minutes after the second half had started as they made it 2-0 on aggregate making the final looked dead and buried for The Eagles. But they rallied back scoring 3 goals in 10 minutes and held on in the end. It was the club’s first Coppa Italia win since 1958, a night Cragnotti will never forget as it was the first trophy of many under his ownership and for the supporters. They also had the chance to do a cup double, the first double in the club’s history. It was the UEFA Cup final against Italian rivals Internazionale who had finished runners up in the league. It wasn’t to be for the blue side of Rome as they were well beaten 3 nil with Ronaldo and Ivan Zamorano being the stars of the show as they tore the Lazio defense to pieces. The cup win was something to savor though as it got them back into Europe in the Cup Winners Cup for the following season. Two seasons on and Cragnotti had added another two trophies to the cabinet winning the last ever Cup Winners Cup against Spanish side Mallorca at Villa Park and also the European Super Cup against Manchester United who had just won the famous treble the season before and is probably Lazio’s most famous victory in European competition. For the 99/00 season, Lazio was considered one of the favorites for the title due to just losing out the season before to Juventus by one point on the last day of the season. Fans were starting to worry that that the lucrative Scudetto that they have chased for years was never going to happen. The season started brilliantly for The Eagles with only one loss in the first 14 games and had a two point lead for the majority of that unbeaten run over their closest rivals AC Milan and Juventus. Marcelo Salas impressed the most over that run scoring over half his tally that he got for the whole season. 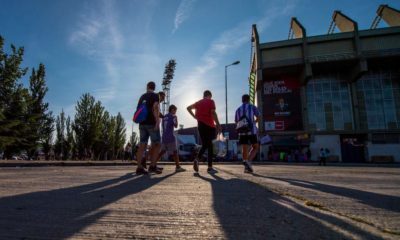 The Eagles were top come the turn of the millennium and fans were starting to believe that it was their year to win the first Scudetto since 1974. But the Christmas break did The Eagles little good. Lazio only managed to win one of the first four games after the break with an embarrassing defeat against Venezia and by the end of January, Lazio were off top spot. February came round and it looked like Lazio were back on track with a win over Torino but it was not to be as Lazio only picked up one more win in that month. By the middle of March Lazio’s bad form started to really show giving themselves a nine point gap to chase over the Old Lady. They finally won back to back at the end of March leading into April. This was the first time they had done this since December. They faced Juventus in a must win game and they came out on top putting The Eagles right back in the title hunt leaving themselves only needing to get another 3 points to go level with the Old Lady. But a draw against Fiorentina all but put another dent into The Eagles’ title hopes as they had to make up a five point gap with three games to spare. By this point Cragnotti and the supporters were starting to see the season as a failure due to the capitulation since the turn of the millennium. By the end of April, Lazio were knocked out of the Champions League in the quarter final stage convincingly by Valencia and were also in the Coppa Italia final against Internazionale which was not much of a positive for Cragnotti due to the high expectations at the start of the season. Going into the last game of the season Cragnotti’s dream of bringing the Scudetto to the Sky Blue side of Rome was still possible with a home game against Reggina which they ended up winning 3 nil. In the game between Juventus and Perugia, a game delayed by 30 minutes due to the constant rain coming down during the break. Luck struck for the Eagles with 30 minutes to go as Alessandro Calori scored with a half-volley to put the home side one up. Juventus tried everything to get back into the match but their fourth defeat in the final eight games completed the collapse and handed Lazio their first title since 1974. A pitch invasion began with fans wanting to join their owner who made their dream come through on the hallowed turf of the Stadio Olimpico, a day which will be for sure never forgotten in the history for Lazio supporters. 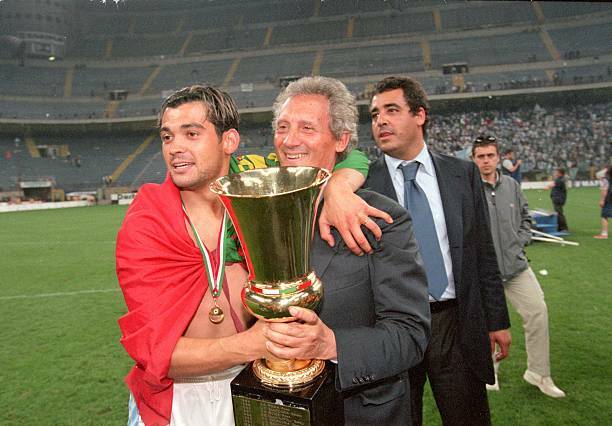 Four days after the title win Lazio played Inter Milan in the Coppa Italia final with a chance to complete a historic double for the first time in the club’s history. 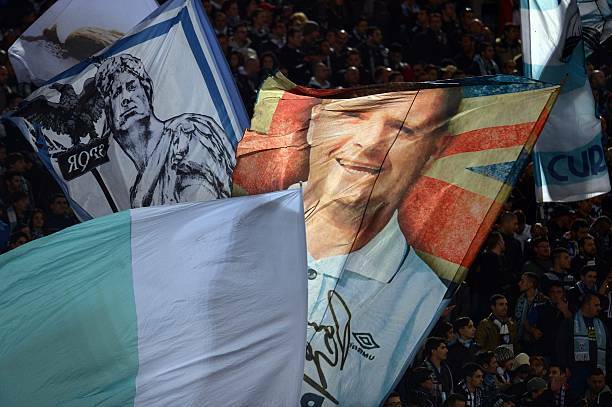 Lazio won 2-1 over the two games making the season even more memorable for the Sky Blue of Rome. Few months on and Lazio were regarded as the best side in Europe by many. But things started to go sour for Cragnotti on the financial front with him having to sell his best players like Pavel Neved to Juventus which upset supporters who started to question the financial stability of the club due to the spending over the last decade. In 2002, Cragnotti had to leave the club due to his financial difficulties caused within the club and also with his main company Cirio. Top players from the club were sold to make money back to cut down debts with results in the league becoming worse because of this with players like Alessandro Nesta, Hernan Crespo, and Pavel Neved to name a few who had to be sold. The tenure of Sergio Cragnotti of being the owner of Lazio came at a price. His pumping of money into the club to bring top players in from around Europe excited the fan-base for the coming years but the relationship between fans and owner turned sour pretty quickly after the double winning season with the selling of top players and Cragnotti not giving an explanation for it. Lazio’s status as one of Europe’s big boys sadly came to a quick end. Sam McKeever is a 19 year old from Dublin, Ireland who has a massive passion for the beautiful game. He is a Manchester United and Hibernian fan with a passion for League of Ireland thrown in there as well. He's also a regular at Republic of Ireland games.